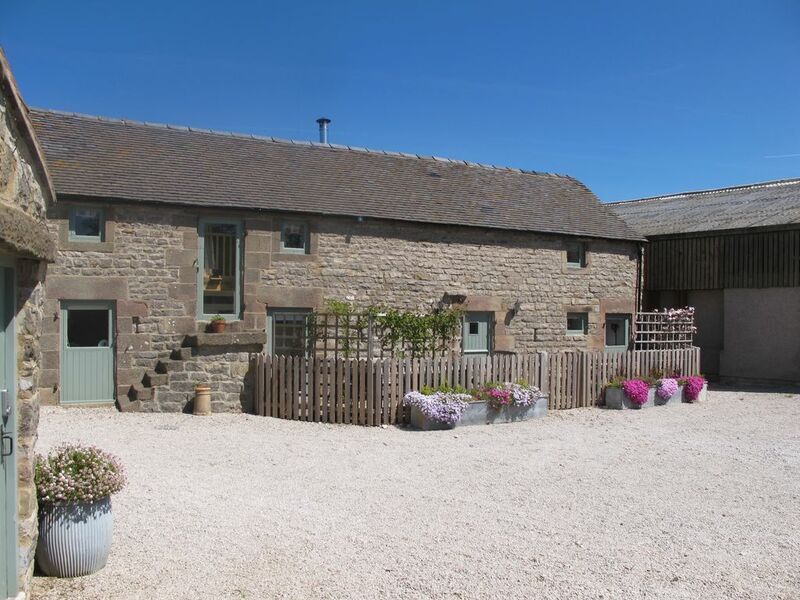 Winn is a beautiful Derbyshire barn lovingly converted into a 4 bedroom Cottage sleeping 8 people. There are 3 bedrooms downstairs and one upstairs, 3 of the rooms can have either king size or twin beds the other is a king size room. There are 2 bathrooms one with a shower and the other a bath. There is a very well equipped kitchen diner leading through to the sitting room perfect for large gatherings. We have four cottages sleeping up to 18 people and we are located just 1 mile from Carsington reservoir with its water sports and cafes, down a quiet lane nestled in the valley with footpaths from the doorstep taking you from your back door to the historical village of Tissington or up to The Old Gate Pub in Brassington and beyond. All our guests enjoy our large indoor heated swimming pool with stunning views across the valley whatever the weather, perfect for burning some calories or a quiet relaxing swim. Each of our cottages are individually styled with their own character but every one is superbly comfortable and equipped with all modern conveniences including wifi as well as a log burning stove in the sitting room, all the bedding and towels are provided. There are plenty of books, games and dvd's too. Each cottage has a modern well-equipped kitchen and dining room and for nights off from cooking there are several excellent pubs and restaurants within walking distance or a short drive away. The area is packed with sights to see or activities for all ages with Chatsworth House, Haddon Hall, Kedleston Hall and Carsington Water, Alton Towers Gullivers Kingdom as well as Dove Dale, Ilam and the High Peak and Tissington Trail just minutes away. And for later each cottage has a private patio garden with seating, bbq and chimneas. We have tried to think of everything. We immediately fell in love with the property on our first visit because of the wonderful homely feel when we walked in. The setting and location is perfect, the views across the valley are amazing, it is both peaceful and beautiful but still close to everything. There are 2 bathrooms one upstairs with a bath and the other downstairs with a shower. A large towels and a hand towel are provided per person. For the use of cottage guests only. The swimming pool was great, the children had a fantastic time. The cottage bedrooms were comfortable, although sitting room, kitchen and eating areas were very cramped. We were only 7, three of whom were children. Just a few small things - needed to clean the grill on the Bbq after previous occupants use, and the laundry room is across the court yard, shared by all and coin operated, £7 for a load for wash and dry. Small things but at the cost of the cottage had expected otherwise. On the whole a very pleasant stay. Such an excellent time we had in Derbyshire. Vikki, Tim and family were so very gracious. They made our stay so much more enjoyable. Towns, entertainment and restaurants were all nearby in the beautiful countryside. The bonua was the heated swimming pool on premises. The kids had a great time even during rainy days. Totally recommend to families! We stayed in the Woodshed cottage for 3 nights and absolutely loved it. The cottage was finished to a very high standard and had everything we needed. A welcome pack greeted us upon arrival which was a nice touch. The standard of the finishes was top drawer and lovely to come home to after a day out and about. With our 3 year old in tow, the pool was ideal and we used it everyday (had it to ourselves!). Like the cottage, it was beautifully finished and spotlessly clean - even with it's own sound system t hat you can plug your ipod into! The cottages are gathered around a courtyard area and the riding school is right next door so our little one loved seeing the horses each day. All in all, a great set up. One of the nicest cottages we've ever stayed in. We are in a lovely rural location but only 1 mile from Carsington Water and 10 minutes drive to Ashbourne or Wirksworth and only 25 minutes to Chatsworth or Alton Towers.